Navigation: Home » Personal Finance » What Was Your Savings Rate in 2018? What Was Your Savings Rate in 2018? Every year, the “blessing” of tax season provides us the “convenient” opportunity to examine our personal financial performance in the previous year. And what is the most important marker of financial performance? I’m glad you asked – I’d argue it’s your savings rate. When you’re staring at documentation on income and taxes, you might as well sum up either spending or savings. If you know three of the four, then you can compute the fourth for free. In 2018, our family’s net after-tax saving rate was 44.0%. Using an expansive savings definition including principal paydowns, our savings rate was 50.6%. We’re generally not fans of the more expansive savings rate. However (speaking of ships), that ship has sailed – most personal finance experts and bloggers use an expansive definition of after-tax savings. For the last three years we’ve computed both rates. Why don’t you like principal payments in saving rate? First, to be clear: we lost this argument. 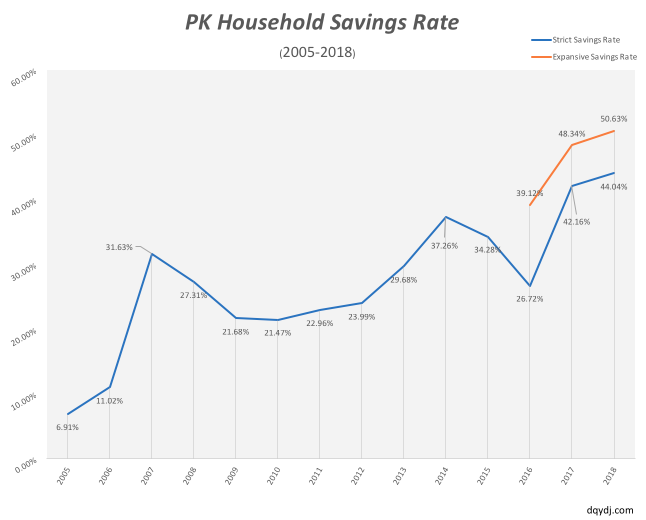 When you compute your savings rate, you should include principal paydowns. This means the portion of your student loans, auto loans, property loans, or other installment loans which goes to principal counts as savings on the year. This is because principal paydown is accretive to net worth: if you pay debt now, you obviously don’t owe it anymore. Our problem was (is) calling that savings. Take a 6 year car loan, for example. In nearly 100% of cases, you can’t resell a car for your purchase price after 6 years. That’s 6 years of tracked phantom savings! Of course, since 2009 or 2011 in the US, real estate is a huge exception – everything is more expensive now. Presumably, after 6 years of mortgage payments you’d more than capture your additional principal if you sold. So… it’s a complicated subject. We have computed a rate using both methodologies for the last few years. Those nuanced feelings aside, we were very happy to pass the 50% savings rate point for the first time! 50% is the most important magical breakpoint for savings rates. When you save 50+% in a year, you’re banking one year’s worth of expenses for a year of spending. On top of that, high savings rates are deceiving. The difference between a 75% savings rate and 80% seems tiny. However, a 75% savings rate is the same as saving three years worth of living expenses while an 80% savings rate is four years. Buried in that 5% percentage point difference is an entire year of work! So, we’re very happy to crack 50%. In 2019 we hope to save an even higher percentage of income – especially as (we suspect) the economy is going to slow down a bit. Or… at least not grow as quickly. We’ll have an asset allocation post soon so you can see how we’re positioned going into April 2019. What was your 2018 savings rate (calculated using your favorite method)? Where do you come down on savings rate methodology? What’s your 2019 savings rate goal? A great time for this posting! I completely agree that savings rate is one the most important variables to tracking. Actually I think the positive improvement of one’s savings rate is hugely important. The raw number is important but continuously improving on that number it is REALLY important. Gross Savings Rate: This is just so darn straight forward to measure and measure the positive improvement that it is my favorite variable. Total Savings/Gross Taxable Income. We do include some pre-payment of loans but ONLY additional amounts to the principle. We only have a mortgage in terms of debt so any additional payments to principle above the normal terms of the loan count as savings in my eyes. We do not include the normal principle portion. Net Savings Rate: Same basic formula but with all taxes removed (Federal income tax, State income tax, FICA, Medicare, NJSDI, etc). This gets a bit messier but it can be calculated. Great numbers, and nice that you’re also pointed in the right direction! Here’s to 50% next year. Yeah the net of tax number is only possible with our return in front of me, too many line items. Of course, having a tax return in front of you triggers… many eye rolls… when doing the math. We do watch net worth too, but prioritize that below savings and allocation. The reason to count principal pay down as savings is because regardless of how quickly one pays down a car debt or a mortgage, the car and house will depreciate or appreciate at the same pace. Thus, the decision to borrow or pay cash, and then use future earnings to pay off the debt or build back up savings is one of liquidity. I agree with the reasoning – again I lost this argument so I do tally it up both ways. However, I rarely see what should be required from this line of reasoning: bloggers and experts don’t (often?) report negative savings when they buy known depreciating assets. If someone saves $X in a year then buys a car costing 5*$X, just reporting the $X betrays the usefulness of the rate. They moved historical savings into a car from (presumably) a better investment, which has a real cost. I guess it depends on where you draw the “savings” line. For instance, my savings account and other short term stores of value including emergency funds aren’t really “savings” as I could very well, and easily, spend that money. I don’t consider it saved until it hits a brokerage account or similar, and that stuff doesn’t get touched. The day it does is the day I report a negative savings rate. Saving up for a couple of years to buy a car should never have counted as savings in the first place. As for net worth, I include a depreciating asset on my balance sheet when I plunk that cash down so that it accurately represents my use of the value over time, rather than just making my net worth graph look like a saw tooth wave. I do the same, the number above aren’t money in checking or savings (even if “staged” for saving). When I look at savings I look at if I sent it to a brokerage account or similar like you. It’s psychologically harder to spend that money so it’s a decent game we play with ourselves. It’s true, but in my mind, using money from a brokerage account for a once a decade purchase of a car would fall under the same “negative savings rate” category as say, cashing out a 401k when switching jobs and then using that money to go on vacation. It makes it much easier for me to not do those things when thinking rationlly about the fact that doing so really is “negative savings.” Anchoring and round number bias are real logical fallacies experienced by everyone, so we might as well use them to our advantage when possible. is there any way to show a distribution of $ value savings per household (ie, 10% of families save over $40k, etc)? that would be very interesting. Sort of – you can take a guess at percentage or value of annual savings using the Consumer Expenditure Survey, but the savings data is really an afterthought there and not really reliable. I might spin through the CEX at some point and build some tools and posts and I’ll try when I do. Any thoughts on doing an update to that article based on the midyear data to be released later this month? I’d be curious to see how savings patterns have changed at each income increment since the financial crisis. There’s a lot of talk out there about young people in the market having forgot, or not experienced, the crash, and how that plays out in their spending and saving behavior. I wonder if the average 25-30 year old has different savings habits today than the same age group did 5 or 10 years ago. Yeah that’s 2012 data, haha – should take another run right? IIRC CEX is September though so would spin through after the CPS drop. thanks for attaching those postings. i don’t really understand the savings rate by asset/expense method. I that saying the average household making $250k save 42.38% of their income? and using asset method their assets increase an average of 8.23% over year? I’d wager that the career length of someone making $250k is probably much longer than the average person, so it makes sense that they would be saving less as a percentage of their assets. If you saved 100% of income the year before you retire from a 40 year career, that should still be less than 10% of your assets, so high savings by income and low by assets makes sense considering I don’t know any 32 year old directors or VPs. No, it’s as confusing & bad as you think – with ‘assets’ one way a bunch of Econ papers calculates savings is the value of assets at the end of the year minus a year before. They then count every dollar as savings. Home value, etc. It’s pretty bad since… a lot of that might be (lately, is) appreciation. For large accumulated sums, this will be mainly changes in asset value not deliberate saving. Expenses is also inaccurate only because the tax values and expenses aren’t perfect. Basically, you get the after tax income from the CEX (like I do here with my own finances), then remove all reported expenses. The rest, wherever funds ended up, is savings. Like I mentioned above that would bump up my rate a few percentage points; I do stage money in some bank accounts I know I’m going to spend.